With the addition of Microsoft Graph APIs for calls and online meetings, Microsoft Teams apps can now interact with users in rich ways using voice and video. These APIs allow you to add new features such as interactive voice response (IVR), call control, and access to real-time audio and/or video streams for calls and meetings, including desktop and app sharing. Audio/video calls. Calls in Teams can be purely audio or audio+video. For brevity's sake, we don't say "audio/video call" everywhere; we just say "call." Call types. Calls are either peer-to-peer (between a person and your bot) or multiparty (your bot and two or more people in a group call). 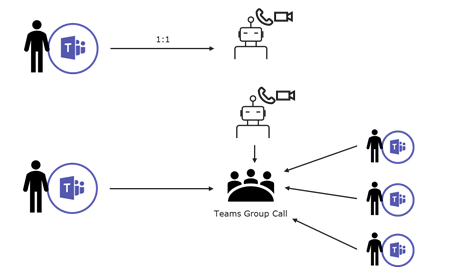 A user may initiate a peer-to-peer call with your bot or invite your bot into an existing multiparty call (although the latter is not yet enabled in the Microsoft Teams UI). No Microsoft Graph permissions are necessary for a user to initiate a call with your bot for a peer-to-peer call, but additional permissions are needed for your bot to participate in a multiparty call, or for your bot to initiate a peer-to-peer call with a user. A call may start as peer-to-peer and escalate to multiparty. Your bot can initiate this escalation by inviting others provided your bot has the proper permissions, but if your bot does not have permissions to participate in group calls, if one participant adds another person, your bot is dropped from the call. To receive an incoming call, you specify an endpoint in your bot settings; this endpoint receives a notification when an incoming call arrives. You can answer the call, reject it, or redirect it to somewhere or someone else. When a bot is in a call, there are APIs for muting and unmuting itself and to start/stop sharing video/desktop content with the other participants. The bot can also access the list of participants, invite new participants, and mute them. Calls and online meetings. From a Teams user's perspective, there are two kinds of online meetings: ad hoc and scheduled. However, from a bot's perspective, it's different. To a bot, an online meeting is just a multiparty call (the set of participants) plus "meeting coordinates," which you can think of as the metadata for the meeting: its ID, the chatId associated with the meeting, its joinUrl, startTime/endTime, and more. Service-hosted media. Bots focus on managing application workflow (e.g. routing calls) and offload audio processing to the Microsoft Real-time Media Platform. With service-hosted media, you have several options to implement and host your bot. A service-hosted media bot can be implemented as a stateless service since it does not process media locally. Service-hosted media bots can use APIs such as PlayPrompt for playing an audio clip, Record for recording audio clips, or SubscribeToTone for subscribing to DTMF tones (e.g. knowing when a user has pressed 0 to reach the operator). Application-hosted media. For a bot to get direct access to the media, it needs a specific Graph permission, but once your bot has it, the Real-time Media Library and the Graph Calling SDK helps you build rich real-time media calling bots. An Application-hosted bot must be hosted in a Windows environment, as described in more detail here.